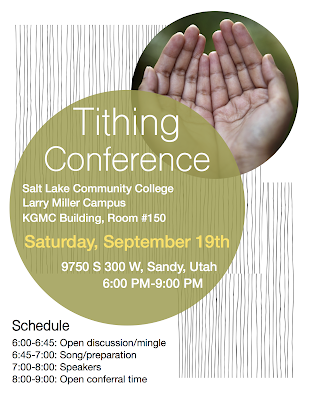 This is an opportunity for the various fellowship and tithing groups to come together and learn from one another. Format: We ask that people be allowed to speak/present without interruption. We have dedicated an hour after the presentations as a Q & A time for individual/group participants to ask questions of each other. Sharing: There will be a clipboard available for groups to communicate with each other “needs” and “surpluses” in a “giving tree” concept. Articles: We have had over a year of this “Tithing experiment,” so there is much accumulated experience to share. Therefore, we are asking for submissions of articles/papers and even just paragraphs from anyone who wants to contribute. Contributions can be lessons learned, progress made, mistakes, scriptural studies, group experiences, miracles and impacts witnessed, testimonies shared, thanks given or as the spirit directs. We will place all the submissions into a pdf and make it available after the conference. We will accept submissions after the conference as well for approximately 30 days. We would like to invite all to come to Utah County, which we hope is centrally located for most to attend. As we have traveled along on this journey thus far, we are feeling the need of further direction in coming to understand our truer purposes as sisters, daughters, wives, mothers, etc. Are you feeling the same? on the subject of ‘how to Come into His Presence' once again. And so we are asking for your humble prayers as we gather as Women with the desire of uniting our Hearts, our purposes, to "Wait on the lord" and see if He will bless us with the things which He desires for us to have and continue the restoration that was begun long ago. We have speakers who are preparing a message. We are interested to learn if you have established work meetings and are sharing your talents, learning new skills and otherwise preparing every needful thing. We thought it would be wonderful to hear a report from every group (women) about your 'goings on', how the Lord is directing you, your successes and your struggles. Maybe you could compose a paragraph with your groups and share with the rest of us. You can email it to eveninstar9@gmail.com. We are joyously watching as we, ourselves, and others around us are better learning to rise up, find our voices with new strengths, with greater balance and Love, and getting out of the stagnant comfort zones which have long held too many of us bound. Have you also stretched and grown? We want to Hear! We would rejoice if you would join us and share in this experience. Dear Sisters Seeking ZION, We humbly ask that your prayers and sacrifices be employed in behalf of this effort that we may attract the notice of the heavens and learn the mind and will of the Lord in our behalf. May the Lord's Love bless us all!!! And until we meet…Thank you for following Our Lord and Savior, Jesus Christ and sharing who and what you are!